If you are the type of person that likes to touch and hold a device before buying it, and resisted the urge to pre-order the new Windows Phones available on Verizon, you will be glad to know that tomorrow, Verizon corporate stores will have the new Nokia Lumia 822 and Windows Phone 8X by HTC in stock Thursday, November 15th. This availability coincides with when the first pre-ordered devices should be out for delivery the same day. 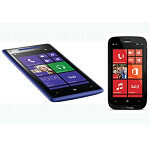 Now, if you had your sights set on a red HTC 8X or a grey Lumia 822, you will still need to order those online as it does not look like Verizon will carry those colors in the store. The black and white Lumias and the black and blue 8X devices should be in stock. The Lumia 822 is only $99.99 on a two-year agreement and the Windows Phone 8X will be $199.99 for the same agreement. Both devices support wireless charging (a Verizon exclusive on the 8X). Each device has its own distinction within the Windows Phone 8 landscape. The HTC 8X has a beautiful 720x1280 display, svelte form factor, 16GB of storage, and a wide-angle front facing camera so the whole family can fit in on a video call. The 8X also has the HTC hub which provides a live tile summary of time and weather if you want it.. The Lumia 822 while considered mid-range has all the standard Nokia experience apps on board, including Nokia City Lens, Nokia Drive and Nokia Music. The Lumia also has 16GB of storage and supports microSD cards up to 64GB. Are you going to pick one up? Which one? wish to have lumia 922! :) how about that ativ s odysey? This article is about phones on vzw. Only a complete fool would just mindlessly chirp in about an at&t exclusive handset. I get a red 8x on the 21st. Of course vzw will make their customers wait. Watch they release the yellow one in about 3 months.